The upgraded GMOS-N detector array consists of three ~ 2048 x 4176 Hamamatsu chips of two different types arranged in a row. 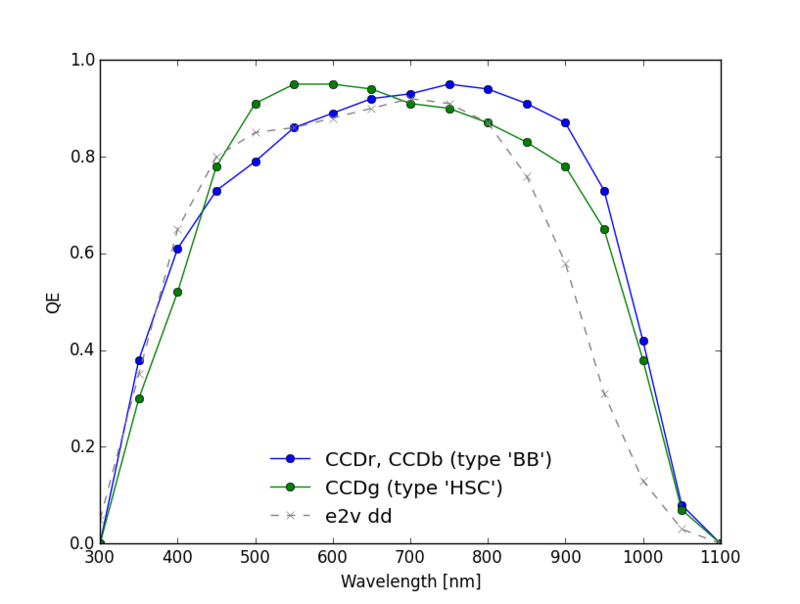 The central CCD (CCDg) has an enhanced response between ~450 and 650 nm compared to the left- and right-most CCDs (CCDr and CCDb, which probe the red and blue end of the spectral dispersion). CCDr and CCDb are both of the same type and have an enhanced response below ~450 nm and above ~650 nm. In the ITC, the central CCD is referred to as "HSC", while the two outer CCDs are referred to as "BB". The Hamamatsu detector array has the same orientation as the previous e2v deep depletion array and continues to support Nod-and-Shuffle mode. The expected QE of the GMOS-N Hamamatsu CCDs compared to the previous e2v deep depletion devices is shown in the plot below. See the Status and Availability webpage for more details. (*) Due to bright columns on either side of the chip gaps, the effective gap size, not usable for science, is 80 pix = 1.200 mm. The table below gives gain/read-noise values for the GMOS-N Hamamatsu CCDs. The values are averaged over all 12 amps. Slow Read / Low Gain is the primary mode for science use. Fast Read / Low Gain may be of use, for example, with acquisition observations or for time resolved observations. Fast Read / High Gain is expected to be used primarily for very bright targets. 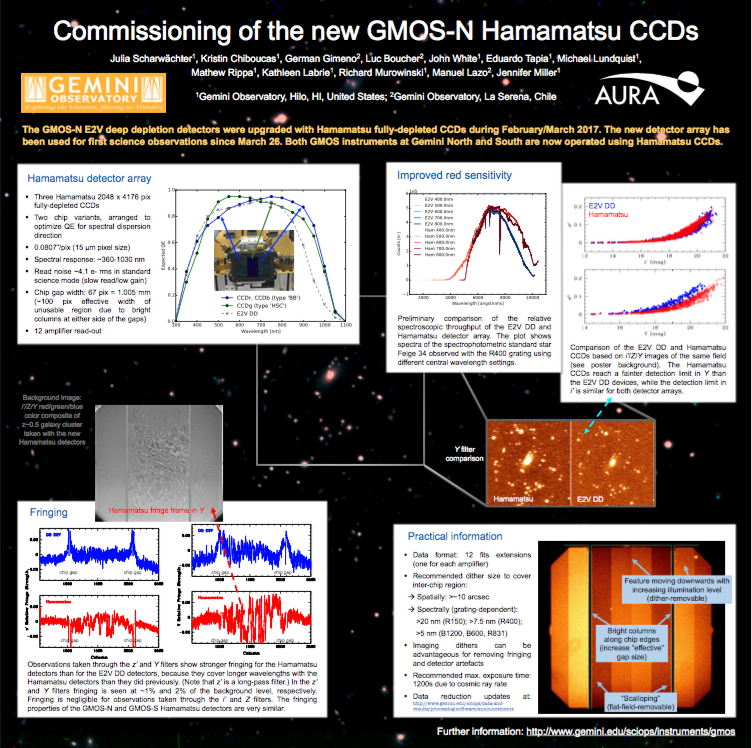 The cosmic ray hit rate is higher on the Hamamatsu CCDs - about 2.6 times more pixels are affected by cosmic rays, as compared to the previous E2Vs. As for GMOS-S, it is recommended to keep individual exposure times <=1200 s.